Does ArcGIS Desktop have equivalent to RStudio Console Windows? Starting use RStudio as a GIS. One of the reasons I'm starting to move from ArcGIS to R is the need for reproducibility in my analysis. Much of the analysis I'm doing is scripted. But wondering if there is a way to keep using Esri. One of the features I really like RStudio about it is the Console, which acts as a command line interface. But it also logs the equivalent of the command line code you would have typed in when you run something from the GUI. 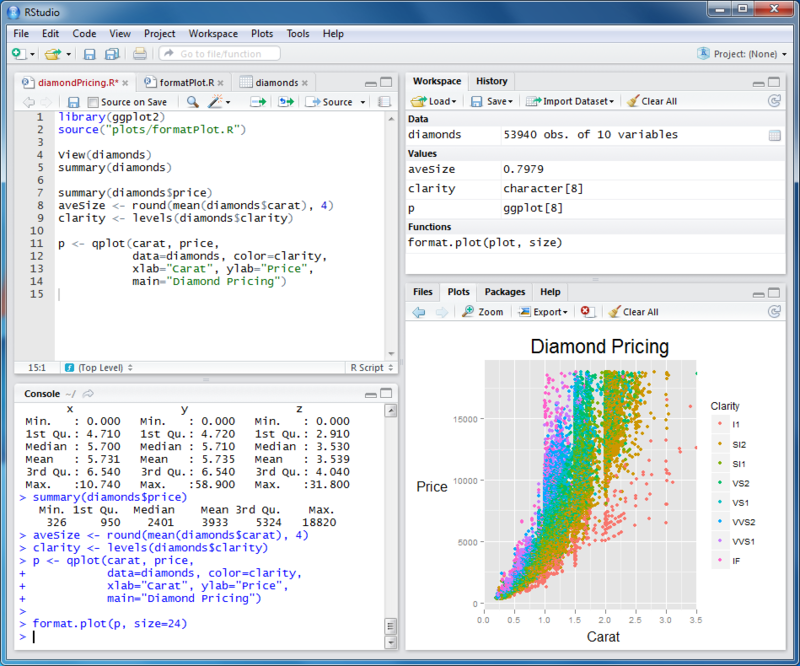 This has been very very helpful in learning R.
Is there an equivalent for the Python window, so I could see the inputs from my GUI in Esri as the equivalent Python output code? That would make translating GUI inputs into a Python script much much easier. It would also make reproducing analysis much easier, as I'm repeatedly being called on to perform similar analyses, but months apart. Using 'Record Macro' in EXCEL to record the VBA equivalent of my GUI commands, and then editting the VBA code to create a new script/macro. Is there a similar way to document my workflow in ArcGIS? Developing GUI in Python for ArcGIS geoprocessing using PyQT/Tkinter/wxPython? Can anyone recommend an Arcpy GUI? It is not included in the ArcGIS install, but adding the iPython Notebook to your workflow sounds like exactly what you're looking for. I think a record macro option should increase a lot of people's workspeed with ArcMap, without needing highend programming skills, similar as in MS Excel. Years later, it seems it has become feasible (for some tools), to after running, in the Results box, to right-click and select 'copy as Python Snippet'. Not the answer you're looking for? Browse other questions tagged arcpy r gui or ask your own question. Does ArcPy have a spatial search function for geometry? Does Identify tool of ArcGIS Desktop have Python script behind it? How Do I Snap a CSV to a SHP Using ArcPy? Does Avenue equivalent of pointPosition exist in ArcGIS 10.2? Does arcpy.GetParameterAsText() have a data type? Possible to call Rscript from ArcMap Python console without it opening up Windows cmd console?